Fal de ral, de riddle al de rey! Fal lal lal lal riddle al de rey! Oh dear, the wassailers are here, already! And my Lords and Ladies! with a ditty whilst I, um, determine the state of preparations. (exiting) Page?! Where are you?! The wassailers and the Court have arrived for the Feast of Stephen. The boar’s head in still in the oven, I believe. Very good. Is the wassail ready? The cook has just put the cider on the stove. Very well then. And where is the Good King? Ah, the Good King. He, ah, went to look out. He went to look out? He went to look out. On the Feast of Stephen? What with the dragon on the loose, eating his subjects left and right, I fear the Good King is anxious on account of his knights. Knowing his knights, I’d be anxious too! While we wait, let us hear if the wassailers are fit to sing for the King! Music Master! Let us hear something then! My Lord Page! The King! Your Majesty! The Feast is ready to begin! Where have you been? My Lord Page! We were detained by affairs of state. Indeed. But our knights have the situation well in hand, we hope. Well then! Lords and Ladies of the Court! Welcome to the Feast of Stephen! Tonight we celebrate the coming Winter Solstice with feasting, music, and merriment! As the longest night of the year approaches, let us be thankful for the gifts that have been given us! Together, with story and with song, we can drive the dark away! Let the festivities begin! Your majesty, what of your knights? Those who have not been eaten were to have returned for the Feast. Alas, our poor knights! They have not returned! Look! Here comes one of your knights now! We know not. Pray tell, who is he? That, Your Majesty, is the Silent Knight. Groans from Concert Chorus, Treble Chorus. I believe, sire, that the wassail is ready to be served. Excellent! Let us be served! My dear wassailers, the moment has arrived! We are pleased to be entertained by your minstrelry! Bring on the wassail! Marry, this is the finest wassail we have tasted this many a year past! And better still than the wassail, the wassailers! Three cheers for our fine singers! Your Majesty, another knight approacheth! What a strange fellow! How he doth carry on! We do not recognize yon knight either, pray, who is he? …and he went all through the house! Your Majesty, The mummers have not yet arrived, but the boar’s head is ready to be served! Blast! It will be a sorry feast if we have no mummers to play for our dessert. We hope that they have not been eaten en route. This accursed dragon hath laid waste my kingdom, eaten my knights, and now even threatens to spoil our winter solstice celebration! We had hoped to feast on dragon tail this year and dispense with the gnarly old boar’s head for a change…still, a tradition is a tradition! What would the Feast of Stephen be without it? Indeed. Perhaps you have something there. Next year, let’s have tofurkey instead. But there’s no use letting all of our cook’s labor go for naught. Bring on the boar’s head! Bring on the boar’s head! Your Majesty, the boar’s head! …and a delicious looking boar’s head it is! Music Master! What entertainment has the Court prepared for our diversion this evening? Our first selection is a traditional carol from Kentucky, Your Majesty. Kentucky? I have heard of it, it is nigh unto France, I believe. It is my understanding that Kentucky is even closer to home than France. Indeed. Well then, carry on! Wait! Wait for me! I’m coming! And I have seen him! You have seen him? Seen who? The dragon, Your Majesty, and he’s coming this way! Pray tell, how far off is he? About a good league hence, Your Majesty. Right against the forest fence! Oh dear! We’d best carry on with our feast lest it be interrupted and the feasters become the feast itself! The dragon ate my choir folder. Now that’s an excuse I haven’t heard before! Now don’t tell me! Let me guess! That…is the Late Knight! My Lords and Ladies! Thy sweet and melodious singing hath quite taken away our appetite! Truly, the taste of food pales before the splendor of such delicious music. We must partake of this feast! No longer shall we tarry at meat – tonight we dine on the concorde of sweet sounds! A song in the French style by the honorable Orlandus Lassus, late of Italy and the Netherlands. ‘Tis a fine ditty! We must have it again! But this time in English, we’ll have no more Frenchifying this night! Marry, ‘tis a sweet and melancholy air! What is the next course, O Music Master? A song in Hebrew, Your Majesty. A song of peace, and of our wishes for a more harmonious world. Such delectable music is truly fit for this King! On what shall we dine next? Your Majesty, allow me to present to you my humble offering for this evening, a setting of the famous song from As You Like It by the honorable William Shakespeare, late of London and Stradford-on-Avon. Ah yes, Willy the Shake, we know him well. Most appetizing! Thou hast surpassed thyself this evening, Music Master. Page? Be certain to set aside the leavings from the boar’s head for the Music Master’s dinner this night. The last course, Your Majesty. 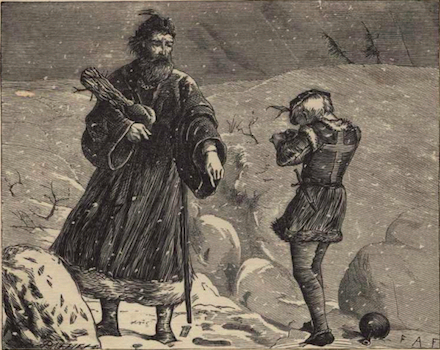 From Spain, a traditional carol of the season. My Lords and Ladies! Music Master! We thank you for the most satisfying feast we have devoured this many a day past! Bravo! Your Majesty! My Lords and Ladies! The mummers! The dancers! They have arrived! The mummers! Hooray! The dancers! Etc. My Lords and Ladies, pray, be at thy ease. Now let us feast upon the frolickings and entertainments of the players for our justly earned dessert! please credit Walter Bitner as the original author. play by Walter Bitner & Jody Kruskal. please credit Walter Bitner & Jody Kruskal as the original authors. ‘The Feast of Stephen’ is inspired by the life and work of the late John Langstaff (1920-2005) and Revels, his legacy.